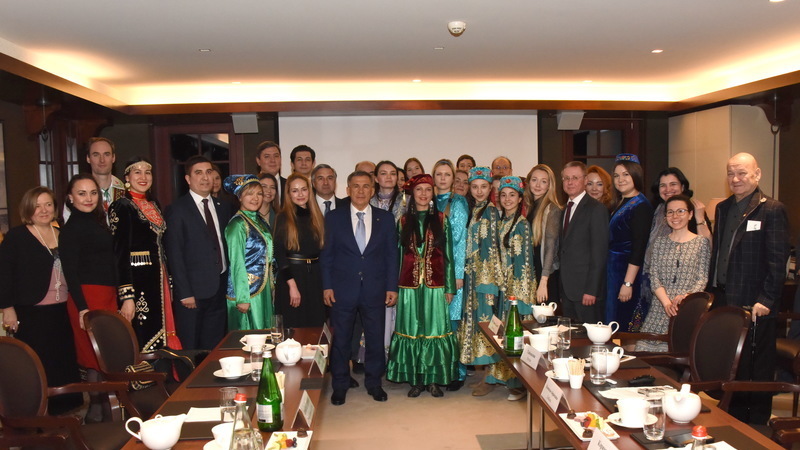 On March 23, during his working visit to Geneva, Tatarstan President Rustam Minnikhanov had a meeting with representatives of the Tatar Diaspora living in Switzerland. Minnikhanov was informed that at the initiative of the Tatar and Bashkir Diasporas the Association of Tatars and Bashkirs "Yuldash" was established in Geneva in 2015. The organization includes 13 activists. In total, there are about 150 Tatars and Bashkirs in Switzerland. Head of the Association Regina Schegoleva said that the representatives of the association regularly hold various events, including Tatar tea parties, master classes on Tatar cuisine. The Sabantuy holiday, which gathers about 400 people, has been organized in Geneva annually since 2010. The city administration provides an open area with a stage for these purposes, she added. Gulzhikhan Kashaeva talked about the preservation of the Tatar language. The Kashaev family moved to Switzerland more than 10 years ago. Despite this, the spouses are fluent in the Tatar language, they teach their three children the native language. According to Gulzhikhan, adding the Tatar language to a popular Google Translate online translator could contribute to supporting the language. Minnikhanov liked this idea and asked Minister of Informatization and Communication of the republic Roman Shaykhutdinov to look into this possibility. Minnikhanov thanked the members of the Association for their attention paid to the preservation of their native language and traditions. "With large-scale globalization, there is a risk of the disappearance of many languages. This is a big problem. Therefore, it is necessary to use all the possibilities to prevent it. Today only 30 per cent of the Tatars live in Tatarstan, the rest live in other regions of Russia and abroad. Only thanks to such pro-active people like you we will manage to preserve our language and culture. Otherwise, we can lose all this,” Tatarstan President emphasized. He said that a number of projects aimed at uniting the Tatars around the world are underway in the republic. They include a distance educational programme for those who want to study the Tatar language "Ana tele", “Salat" children's camps and a satellite TV channel "TNV-Planet" in the Tatar language. Summing up the meeting, Minnikhanov handed in the Letter of Acknowledgement of the President of the Republic of Tatarstan to Regina Shchegoleva for her special contribution to the preservation and development of the language, culture and traditions of the Tatar people.